Dry hair needs instant hydration and nourishment to keep it looking and feeling healthy, otherwise it becomes brittle, discoloured and breaks. NOUNOU Nourishing Repair Mask is made with olive butter to soften and moisturise; jojoba oil is infused to make it shiny and to counteract static and flyaways. Cherry oil and rhizobian gum add natural body and an intense moisturising action. It's packed with natural anti-oxidants and protective properties and will leave your dry locks instantly shiny, soft and restored. Dry hair needs instant hydration and nourishment to keep it looking and feeling healthy, otherwise it becomes brittle, discoloured and breaks. This Mask is made with Olive Butter to soften and moisturise; Jojoba Oil is infused to make it shiny and to counteract static and flyaways. Cherry Oil and Rhizobian Gum add natural body and an intense moisturising action. It's packed with natural anti-oxidants and protective properties and will leave your dry locks instantly shiny, soft and restored. 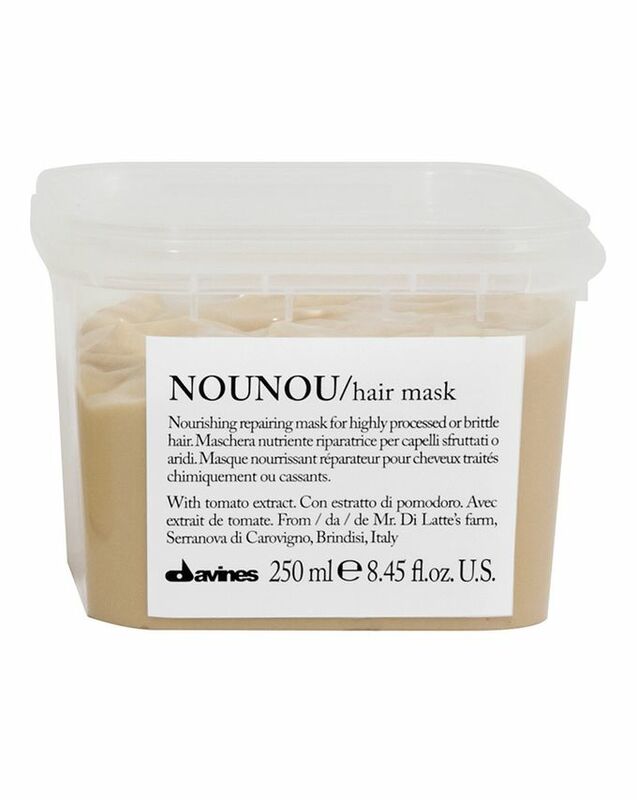 Apply a small amount to clean towel-dried hair (this can be used in conjunction with ANY shampoo including the NOUNOU Nourishing shampoo). Comb through your hair for even distribution. Leave on for 10-15 minutes and rinse well. TOP TIP: For seriously damage wrap conditioned hair in cling film and soak in the bath the heat will activate the mask to sink deep into the hair shaft for extra repair. Water, Cetearyl Alcohol, Glycerin, Behentrimonium Chloride, Cetrimonium Chloride, Cetyl Alcohol, Dimethicone, Behenyl Alcohol, Benzotriazoyl Dodecyl P-Cresol, Fragrance, Benzyl Alcohol, Simmondsiachiness (Jojoba) Seed Oil, Olea Europae (Olive) Fruit Oil, Amodimethicone, Dicapryly Ehter, Lauryl Alcohol, Disodium EDTA, Octadecyl Di-T-Butyl-4-Hydroxyhydrocinnamate, Sodium Benzoate, Citric Acid, Hydrogenated Olive Oil, Tocopherol, Solanium Lycopersicum (Tomato) Fruit Extract, Linalool, Geraniol, Limonene, CI 19140/Yellow 5, CI 14700.Red 4, CI61570/Green 5. I am writing this review for people who, like me, have fine long hair, dry and brittle. This product is outstanding as it is very different from all other seemingly heavy duty masks. First of all, yes, it is thick but will absolutely not weigh your strands down. Make sure that you towel your hair well first, then apply a small quantity of product. However, if you happen to use too much, or apply near the scalp, do not worry, it won’t weigh your hair down. For those with dry hair, leave it on for 15 minutes at least: your hair will drink it up. For me the most striking feature of this lovely-smelling all-natural mask is that it detangles your hair just fine while you leave it on to work its magic: l find little to none hair on my brush after l comb it through my hair before rinsing it. 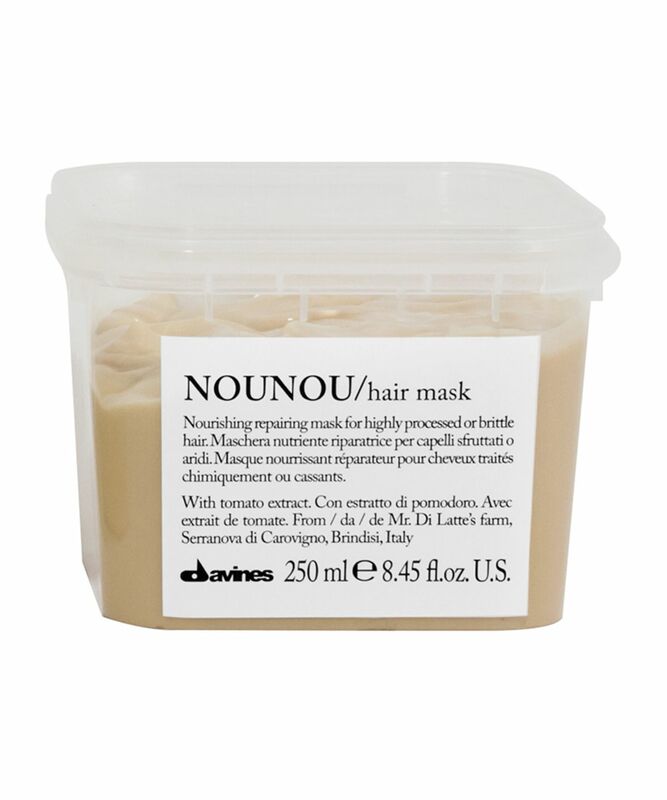 I use this after Davines NouNou shampoo, another excellent product that will leave your hair soft by itself. However, this may not be the right choice for normal hair: it is really aimed at dry brittle hair, or your hair may end up greasy. I bought both shampoo and conditioner. My hair usually needs washing every other day, but these left me with seriously greasy hair day one. I would not recommend. JUST WOW. I recently had my hair bleached for the first time and I was so unhappy with the damage to my hair (which is naturally very thick, coarse, wavy and prone to frizz). My hairdresser actually said my hair held up well to the bleach but it felt very unhappy to me. Looked about for a recommended heavy-duty repair mask (I already used a normal hydrating mask weekly but felt it wasn't going to cut it this time) and stumbled upon this. OVERNIGHT my hair was back to normal, and with continued use it is even softer and shinier! With my new bleached blonde hair I am also heat-styling more than usual to get those fashionable waves, and my hair's condition is still great - all thanks to this mask. I am now going to look at the rest of the range for other products, and this one is going in my all-time beauty product hall of fame. I bought this on the recommendation of my hairdresser, who gave me a sachet of the product to try at home first. My hair is naturally brunette, so it's gets in bad condition after exposure to bleach and sunshine. I love this mask, my hair just drinks it up. Important to towel dry your hair first, otherwise it won't work any better than a conditioner. I really don't like this hair mask. First, I hate the smell. Second, it leaves my hair in knots. I have tried better and cheaper hair masks. Never will I repurchase this. Apart from using Living Proof Frizz shampoo and conditioner from this site. This is also a fantastic conditioner that I like to leave on overnight. Fab for thick, course, fizzy coloured hair. It's a bargain for the price. I picked this up as a complete random purchase having previously never heard anything about the brand, but the simplistic packaging appealed and I do love a hair mask. I honestly wasn't expecting much, as the hair masks that I use regularly work out at about double the price. However in terms of leaving my dry & damaged hair soft and conditioned this is easily as good as all of my favourite masks. My hair felt amazing as I rinsed out the mask and when dry it was soft and smooth, none of the knotting I often get when I try a different conditioner/mask that isn't nourishing enough for my hair. I really like this mask. I have thick wavy waist-length hair, and this mask makes it softer and shinier, easier to brush. This is the best conditioner I’ve ever used. My hair is dull, coloured and brittle and this consistently smooths it with it making it limp and unable to style which a lot of other conditioners do. I will flag up that this product is overpriced here. For the first time in my life I don't need to wash my hair every day! This mask at first looks like it doesn't do much, but later in the day I can feel my hair much softer, shinier, and like I mentioned it doesn't get greasy for 2 days. I had big hopes for is mask. Really, I've tried so many products from high price shelves with no results. This makes was also a big disappointment, it is heavy and made my hair looking greasy. I used it 5 times and there the rest. Lovely mask, works fantastically on my super dry ends. My hair is softer and shinier than ever. Will definitely be checking out the rest of the range.